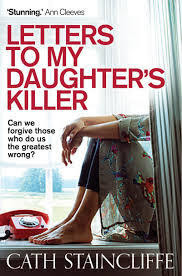 Ruth Sutton's daughter is killed, Ruth decides to write letters to her daughters killer in prison. Ruth is left to raise her granddaughter after her daughters death. She hates her daughters killer more than anything in the world but she needs answers, she needs to know why he dd what he did. Why her daughter? Why now? I was unsure about this book at first but once I got into it I really enjoyed it. The only criticism I have really is, I kept expecting a reply back from the killer, I think even if just the last chapter was a reply this would of been very interesting. I felt this was what was missing from this book. But none the less, I did enjoy the book, I had a feeling about a quarter of the way through who I thought the killer was and I was right. I wasn't however expecting the plot twist towards the end of the book, I found this really added to the story line. Another brilliant story by Staincliffe, with fantastic characters, a wonderful plot which was interesting and easy to follow, it kept me gripped and wanting to turn the next page which is what I always look for in a good book.